There are many "what if" versions of cartoon history; what if the Flesichers had made feature length films during their prime(1930-1934)? What if Bob Clampett's unit came under Scribner's control, rather than Mckimson's? Perhaps something of an answer to the latter question can come with the above short. Scribner was a brilliant and crazy animator, as was Jim Tyer (although, admittedly both were also drastically different in many ways). 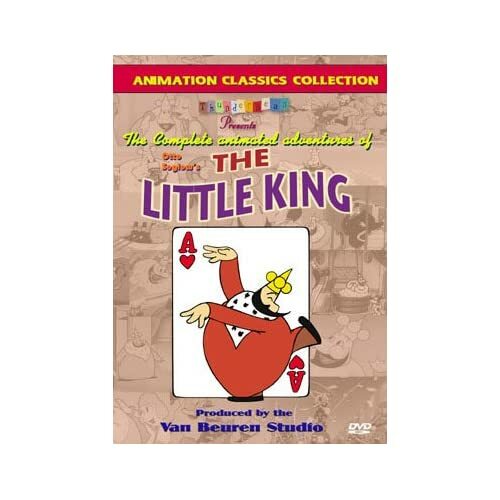 The above cartoon is one of Tyer's few directing credits, oddly enough for the Van Buren Studio, one of the "Little King" series. It's notably crude in design, even for the time. It's very proto-UPA, proving that that particular style isn't new (among other evidence) as well as how Tyer had this particular idea of form far before the 1950's. It's also an interesting note in the question of "do great animators make great directors?". Tyer's entry is interesting in that because he is the director there is a notable lack of his insane animation --although to be fair he was still in his infancy as this stage--. It's also carried on Tyer's famous apprentice Ralph Bakshi. He was also a great animator, but as his film progressed he often like to let other carry out his ideas, rather than use his doodles as key frames(the complete opposite of Chuck Jones). Was this part of his live and let live attitude, famously leaned from Tyer himself(check the links at the bottom)? Who knows. In any case an interesting cartoon from the golden age of animation.